The Uffizi Gallery is a famous art museum in central Florence, renowned the world over for the famous and unique artwork it holds. 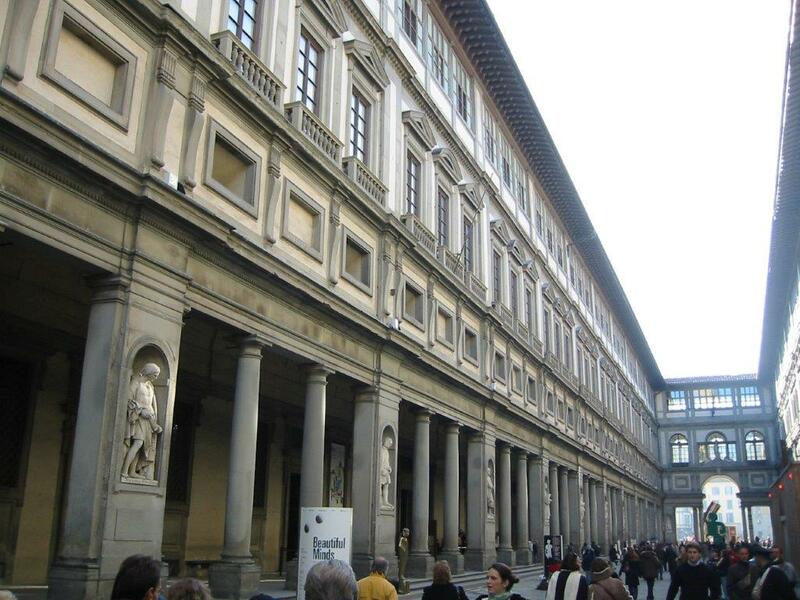 The Uffizi Gallery is one of the most popular places to visit in Florence. The Uffizi Gallery welcomes over a million visitors each year. The Uffizi Gallery and the Vatican Museums in Rome are the two most visited museums in the country. How the Uffizi Gallery Museum came to be. The museum complex was started in 1560 and completed in 1581. The building was created to house the administrative and judicial offices of Florence. This is why it’s called ‘Uffizi’ – as this means ‘offices’ in Italian. The Grand Duke of Tuscany later set up a private gallery on the top floor of the building that held his family art collection. And as time went on, his Medici family art collection became more and more significant, in terms of both its size and what it contained. The family line died out in the 18th Century, but the last remaining member of the family – Anna Maria Luisa de ‘Medici left the collection to Tuscany and ensured that the collection would remain in the Uffizi gallery Florence for the public to see. Sixteen years after she died, the gallery opened to the public. What you will find in the Uffizi Gallery. - Botticelli’s The Birth of Venus and the Primavera. - Leonardo da Vinci’s Baptism of Christ and The Annunciation. - Raphael’s Madonna of the Goldfinch. The Uffizi Gallery is very busy. Book ‘skip the line’ tickets to make the most of your time. It seems that everyone who visits Florence wants to visit the Uffizi Gallery – and rightly so! But this means it is very busy and lengthy entry queues are the norm. So, to make the most of your time, it is best to book a tour with a licensed guide like us at Avventure Bellissime who will be able to arrange skip the line tickets to the Uffizi Gallery. There’s so much to see inside the Uffizi Gallery, that a guided tour will also help you make the most of your visit. The Uffizi Gallery Florence is full of artistic masterpieces. So, if you plan to visit on your own, it’s best to plan what you want to see before you go. And to really make the most of your time, most visitors recommend taking a guided tour with a licensed guide like Avventure Bellissime. Arranging a tour means you will gain from having skip the line tickets for the Uffizi Gallery and you’ll also learn more about the art, its history and about Florence in general. And they’ll also be able to answer any questions you may have as you tour the Uffizi Gallery. - Private Uffizi walk tour. Please feel free to get in touch at tours-italy.com. Also, if you are looking for some travel inspiration similar to this guide on why you should visit Florence, please do check out our other blog posts. We have many useful guides on Italian holidays.